There are two types of concatenation in SDH. They are Contiguous concatenation and Virtual concatenation. In this article, let us learn about contiguous concatenation. 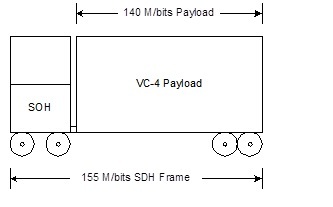 The SDH frame can be thought of as transport lorry. The data to be transported is placed in the VC-4 'Container'. This is then hitched to the SOH 'Cab unit' that 'drives' the data to its destination.The maximum carrying capacity of the vehicle is determined by the size of the 'container'. Therefore although the SDH signal is 155 Mbit/s in size, the largest single circuit that can be transmitted at any one time by the customer is limited to the size of the VC-4 i.e. 140 Mbit/s. When using higher rates of SDH (STM-4, STM-16 etc), multiple 'containers' and 'cabs' are added one after another, to form a bigger vehicle. The customer is still limited to a single circuit size of 140 Mbit/s however, because each individual 'container' is still the same size (140 Mbit/s). They can however transmit multiple 140 Mbit/s circuits simultaneously. The limitation of 140 Mbit/s per individual circuit is not a efficient way of managing bandwidth. In order to overcome this limitation, a method of combining 'containers' together has been developed which is called 'Concatenation'. STM-4 concatenation (written as VC-4-4c), provides a single circuit with a bit rate of approximately 600M (actually 599.04 Mbit/s). STM-16 concatenation (written as VC-4-16c), provides a single circuit with a bit rate of approximately 2.2G (actually 2.2396160 Gbit/s). Amazing, described wonderfully, round of applause for you Sir !! Thanks for the info. Really appreciate it. However can I know whether all the 4 overhead byte section is useful in VC4-4c contiguos Concatenation or only first one? whaat is the diff b/w virtual conca. vs contiguous conta.